Pitching In During the Off-Season Amherst Softball Teams Up With Girls Inc.
First-team All-NESCAC selection Noah Browne ’16 continued his impressive rookie season, finishing 3-0 at Nationals. 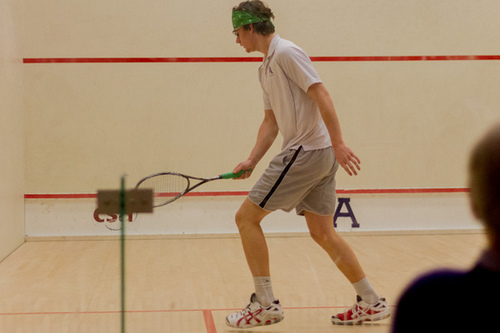 The 20th-seeded men’s squash team finished 21st in the nation after going 2-1 over the weekend in the Summers Cup (C Division) at the CSA National Team Championships held at Wesleyan Univ. The Jeffs dropped their first match to Bowdoin before defeating Conn. College and Drexel Univ. to end their season on a high note. The team came into their first match confident, having defeated Bowdoin earlier in the month at the NESCAC Championships, 6-3. However, only Noah Browne ’16, Dave Kerr ’14 and Max Kardon ’15 were able to emerge victorious for the Jeffs, who fell 6-3. “We had a rough start against Bowdoin,” captain Nick Sorrentino ’13 said. After losing their opener, the Jeffs entered the consolation draw and were able to rebound and defeat 24th-ranked Connecticut College in a tight, 5-4 decision. The Jeffs received wins from their top 4 players, Browne, Charles Loesch-Quintin ’13, Scott DeSantis ’15 and Kerr, as well number six Max Kardon ’15. Browne and Kerr were able to rebound from first game losses in their triumphs. The 5-4 victory over the Camels marked the second time this season that the team topped Conn. College by a score of 5-4. In the final match of their season, the consolation finals, the Jeffs used the momentum of their 5-4 win to defeat Drexel the next day. Browne, Kerr, Alex Southmayd ’15, Kardon and Jake Albert ’15 all tallied points for the Lord Jeffs. Brown, Kerr and Albert all survived marathon five-game matches for emotionally and physically draining victories. Sorrentino praised the team for “pulling through on two tough matches against Conn. and Drexel”. After losing to Drexel in their first match of the season by a score of 6-3, the Jeffs redeemed themselves not only in winning the consolation but also in ending with some hard-earned revenge. The Jeffs will only lose Sorrentino and co-captain Charles Loesch-Quentin to graduation, so the future looks very bright for the team.